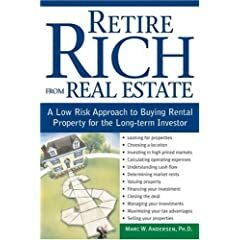 Sphinx Publishing contacted and provided me with a free copy of the new book "Retire Rich from Real Estate" by Dr. Marc Andersen for review. It came at the right time as I'm contemplating putting more of my money in hard real estate assets. Although the book is based on investing in the U.S, the lessons provided in the book are relevant for real estate investors everywhere. "Retire Rich from Real Estate" is just that, it explains from start to finish how to successfully invest in rentals. It's not one of those get rich quick type books, the opposite really. The book focuses on the rental real estate investing strategy and how lucrative it can be for the long run. I'm assuming that the author Dr. Marc Anderson is fairly academic as some of the content in his book is fairly technical in nature. His conclusions are based on research from national real estate investor surveys, demographics and his own experiences. Who is Dr. Marc Andersen? Dr. Marc Anderson is a real estate investor who has 20 years experience buying homes and renting them out for profit. Marc W. Andersen and his wife have been actively buying, renovating, building and managing rental property over the last 20 years. He holds a B.A. from Virginia Tech and a Ph.D. from the University of Virginia. He and his wife live in Raleigh, NC. One point that the author emphasizes is that the key to successful rental investing is to make sure that the property is cash flow positive from day one (a key rule that I follow). From his research and experience with student rentals, he finds that renting to boys means less maintenance calls but with higher chance of damage. Whereas renting to girl students means less chance of damage, but higher occurrence of maintenance calls. On advertising for tenants, his research shows that signs in the yard are just as effective but much cheaper than putting an ad in the paper. As I have a mathematical background, I personally enjoyed the calculations that he explains in the book to determine valuation. He talks about the 10% rule and how it may not be practical in todays market place. What is the 10% rule? It's a rough calculation to determine if a property will be cash flow positive after all expenses. When looking for property to purchase, many real estate gurus state that the annual rent should be at least 10% of the asking price. For example, if annual rents for an area is around $15,000, and the asking price is $150,000, then it would pass the test. If the asking price was $200,000, then the property would not pass the initial 10% rule. Obviously, this rule is not very practical in expensive cities like Vancouver, Calgary and Toronto. However, it's a useful benchmark when doing quick scans of rental properties when investment house shopping. Definitely a book that's worth the money for new or experienced real estate investors. It gives the tools for successful investing from calculating cash flow, to the most cost effective means of marketing for tenants. I've picked up quite a few tips that I will be applying to my next deal. Even though the book is meant for the US market, most of the techniques and strategies apply to the Canadian investor as well. There are only a couple of chapters on taxes and insurance that I skipped over. Sounds like a great book with alot of good info. I see this as a way to provide for your family future for the long term. I have someone I know in the vacation rental business and that has always done good for them. Vacation rentals seem like they might be the way to go. It significantly reduces your exposure to oil prices. 15+ of last 20 years have seen home values go up in NA. It’s kind of like writing a book talking about how much success you had in the bond market from 1979 to 1989 and how you locked in T-Bills at 16% for 10 years. Don’t get me wrong, I’m sure that he has tons of useful insight, but that 10% rule seems rife with issues these days. Not just in silly places like Calgary, but even in low-cost Winnipeg. A 200k house is going need 20k in annual rental income. That’s $1667 / month in a land where luxury 2 & 3 bedroom apartments go for $1100! The market of people who can pay $1700/month but still want to rent AND don’t want an apartment is tiny. So basically, you have to get one of the 70-year old houses for 90k in the “not-so-nice” districts and rent those for $900 to people who can’t afford it. And then, b/c you own a 70-year old house, you basically have appreciating land value (hopefully) coupled with a steeply depreciating home b/c it’s 70 years old! And all of that ignores the fact that property taxes in Winnipeg are nearly double those in Edmonton or Calgary. The wife & I make 75k/year and I would never rent a home at 10% of the value. My mother’s 250k home is simply not worth $2100+/month. I know a guy (in Winnipeg) who does real estate for a living, but he has no cash flow. He charges 5k for a beginners course in real estate investing but otherwise ends up even despite working lots. Maybe he’ll make it big, maybe it’ll feel like he made it big in a few years (b/c he’ll ignore inflation) or maybe the property he’s spent so much time gathering won’t be worth anything. Again don’t get me wrong, I’m sure the book is all you’re pimping it be :) I just want to point out that finding cash-flow positive real estate is not an easy thing, especially if your time is worth good money. Gates, you are a tough customer to please. :) Yes, I agree, cities with housing booms will be very difficult to be cash flow positive b/c of the fact that rents can’t keep up with the underlying mortgage (unless you have a huge DP). However, there are always little gems hidden that fall through the cracks. It’s up to the investor to find them. Successful real estate investing is challenging and it takes a certain kind of person to succeed at it. But then again, if it was easy, everyone would be doing it. As for the 10% rule, I think the rule is even more valuable for cities like Vancouver and Calgary, where imo, you’d be crazy to purchase a house specifically to rent it out. The 10% rule would tell me to leave those alone. Gates, your criticism of Dr. Andersen doesn’t make much sense to me. If you read the subtitle of his book (as seen in the photo), it reads: “A Low Risk Approach to Buying Rental Property for the Long-Term Investor”. He’s not talking about buying and flipping homes so the value of each of the individual properties he owns over the past 20 years is irrelevant. He’s buying for the cash flow, not much different from the long-term dividend investor that buys blue chips and doesn’t much care what happens to their value in the short-term. Considering this book is US-based and recently published (I’m assuming), I think it’ll be a difficult sell as most people have been scared off by serious home price drops in the US. All the more reason his buy and hold approach should be worth considering. There will likely be lots of great properties available that should meet the 10% rule in the near future (and likely now) and perhaps even in Canada soon enough. Like FT said, they’re not obvious as they would have been scooped up already but there are some out there (we own two). Vancouver is in trouble! Our annual rent is $17,400 and the market price of the unit is $370,000. That’s 4.7%. I doubt the market will ever fall by 50% though. I’m interested to see how this new book compares to David Bach’s “The Automatic Millionaire Homeowner.” I found that his book was simple and easy to read, even for absolute real-estate beginners (my sister’s really enjoyed it), and the fact that it comes in a Canadian Edition was great as it speaks of Canadian Banks, CMHC, and all the little fees and unexpected expenses we get hit with upon purchasing! There’s really a pot of gold in real estate business. All you have to do is invest wisely. I hope to read this book in the future. lei: There’s really a pot of gold in real estate business. All you have to do is invest wisely. I hope to read this book in the future. Hey lei, hate to be a downer, but replace “real estate business”, with “stock market investing” and the statement is still true. And yet “wise” stock market investors lose billions of dollars/day, just like real estate investors lose money all of the time. Replace that with “self-employed field” or “making Facebook applications” and your statement is still true, but still no more useful. Real estate is definitely not a magic solution. Investing wisely is a requirement for every investment that you make and it’s never been a guarantee of success. Please don’t imagine that real estate investing is anything other than hard work or you’ll get burned by those who are doing the hard work. I enjoyed the review. Just wondering if there are any other books you would recommend to someone with an interest in acquiring some rental properties, but who is just getting into the game and looking to get up to speed. One I’ve found that looks useful is “What Every Real Estate Investor Needs to Know About Cash Flow” by Frank Gallinelli. Any recommendations would be appreciated.